4.2.2 Is More Than One Mind Necessary for Ideas to Evolve? 4.4 What Caused the Onset of Creativity? 13.6.2 A Joyride for the Visual Cortex? 14.5.4 The "Alive Art Effect"
The use of evolution for creative problem solving is one of the most exciting and potentially significant areas in computer science today. Evolutionary computation is a way of solving problems, or generating designs, using mechanisms derived from natural evolution. 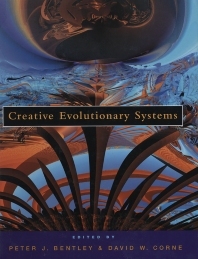 This book concentrates on applying important ideas in evolutionary computation to creative areas, such as art, music, architecture, and design. It shows how human interaction, new representations, and approaches such as open-ended evolution can extend the capabilities of evolutionary computation from optimization of existing solutions to innovation and the generation of entirely new and original solutions. This book takes a fresh look at creativity, exploring what it is and how the actions of evolution can resemble it. Examples of novel evolved solutions are presented in a variety of creative disciplines. The editors have compiled contributions by leading researchers in each discipline. If you are a savvy and curious computing professional, a computer-literate artist, musician or designer, or a specialist in evolutionary computation and its applications, you will find this a fascinating survey of the most interesting work being done in the area today. Explores the use of evolutionary computation to generate novel creations including contemporary melodies, photo-realistic faces, jazz music in collaboration with a human composer, architectural designs, working electronic circuits, novel aircraft maneuvers, two- and three-dimensional art, and original proteins. Presents resulting designs in black-and-white and color illustrations. Includes a twin-format audio/CD-ROM with evolved music and hands-on activities for the reader, including evolved images, animations, and source-code related to the text. Describes in full the methods used so that readers with sufficient skill and interest can replicate the work and extend it. Is written for a general computer science audience, providing coherent and unified treatment across multiple disciplines. David W. Corne is a reader in evolutionary computation (EC) at the University of Reading. His early research on evolutionary timetabling (with Peter Ross) resultedin the first freely available and successful EC-based general timetabling programfor educational and other institutions. His later EC work has been in suchareas as DNA pattern mining, promoter modeling, phylogeny, scheduling, layoutdesign, telecommunications, data mining, algorithm comparison issues, and multiobjectiveoptimization. Recent funded work (with Douglas Kell) applies EC directlyto the in vivo optimization of proteins. He is an associate editor of the IEEETransactions on Evolutionary Computation and a founding co-editor of the Journal ofScheduling. Dr. Corne is on the editorial boards of Applied Soft Computing and the InternationalJournal of Systems Science, and he serves on a host of international conferenceprogram committees. Other recent edited books include New Ideas in Optimization(with Marco Dorigo and Fred Glover), Telecommunications Optimization: Heuristic andAdaptive Techniques (with Martin Oates and George Smith), and Creative EvolutionarySystems (with Peter Bentley). He is also a director of Evosolve (United Kingdomregistered charity number 1086384, with Jeanne Lynch-Aird, Paul Marrow, GlenysOates, and Martin Oates), a nonprofit organization that promotes the use of advancedcomputation technologies to enhance the quality of life. Peter J. Bentley is a Honorary Research Fellow at University College London, known for his research covering all aspects of EC, including multiobjective optimization, constraint handling, artificial immune systems, computational embryology and more, and applied to diverse applications including floor-planning, control, fraud-detection, and music composition. He speaks regularly at international conferences, and is a consultant, convenor, chair and reviewer for workshops, conferences, journals and books on Evolutionary Design and Evolutionary Computation. He has been a guest editor of special issues on Evolutionary Design and Creative Evolutionary Systems in journals, and is the editor of the book Evolutionary Design by Computers (MKP) and is the author of the popular science book, Digital Biology, to publish in May 2001.